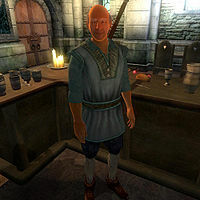 Luther Broad is the innkeeper at Luther Broad's Boarding House in the Elven Gardens District, Imperial City. Luther Broad sells food and beds. He wears one of only two existing blue collar shirts in Cyrodiil and pairs it with the equally rare rugged pants and the more common doeskin shoes. He is armed with a steel warhammer, which he will use to defend himself in case something goes bad. He stands behind the counter at all times, always offering beds and services. When you approach him for the first time, he will introduce himself and his business: "Luther Broad's Boarding House. I'm Luther. You want beds or food, see me." If Luther's disposition towards you is at least 60, you can talk to him about the Imperial City and he will mark Mephala's Shrine and Vaermina's Shrine on your map with the words: "Daedric shrines nearby? I know of two. North of the city, south of Bruma, east of the Silver Road, is a Mephala shrine. East of the city, at the head of the Red River, is a shrine to Vaermina." Asking him if he has a room available to rent will have him reply: "If you've got 10 gold, I've got a room for the night. Deal?" If you agree to rent the room and have ten gold on you he will take the payment and provide directions to your rented room: "The room's up the stairs, and it'll be the first door on your left." If you do not have the necessary amount of gold to rent the room but agree to rent it he will be aggravated with you, and tell you to come back when you have sufficient funds: "Come back when you actually have the money for it." If you change your mind about renting a room and decline on the offer he will accept your choice, and occasionally remind you to return if you ever change your mind. Asking him about the room again after having already rented it will have him wish you a good night's sleep: "I hope you sleep well." This page was last modified on 31 January 2018, at 23:37.